Join me every Saturday in creating projects of mixed media, scrapbooking, card making, altered art and so much more! The first project in this wonderful series is... Home mixed media canvas. I invite you all to subscribe to the new channel and make sure you will not miss any new tutorial, giveaway and so many more surprises! 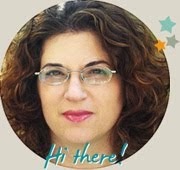 Hi, Einat! I think you need a link to your YouTube channel so that people can subscribe. You're right! Thanks for the input! Wow, I'm here for your premier!! Yay! Beautiful!!!! Thank you for sharing...you have given me inspiration....now I want to go paint a canvas!!! Love that little candy tree...I have to check to see if I can find one!!! Have a wonderful day!!! I'm so happy the video inspired you. I'm so happy you were inspired to try this!! Thank you so much for this tutorial!!! Beautiful result! Fantastic video, Einat - thank you! איפה יופי!! גם יצא מקסים וגם הדרכה ברורה. היה מאוד כיף לראות את תהליך העבודה. תודה רבה! Really your tutorial is one of the best I seen. I want to do mixed media for months but I was unsure how. Now I feel more confortable to start. I suscribe to you on youtube and pinned this tutorial to be sure to find it next time. Thanks!